Emirates SkyCargo, the freight division of Emirates, has launched Emirates Pets, a new and improved air transportation product developed by a team of experts to offer a convenient and comfortable air transportation experience for domestic pets. The product builds on Emirates SkyCargo’s existing capabilities to transport pet animals on its flights and offers new features such as door-to-door transportation as well as booking return flights for pets. With Emirates Pets, the entry-level solution, Emirates SkyCargo will offer airport-to-airport transportation for pets across the carrier’s network of over 160 destinations. The owner of the pet will be responsible for completing all the required paperwork and clearances needed for the transport of the pet from one country to another. In addition, Emirates SkyCargo has also entered into a partnership with Snoopy Pets, a leading pet relocation service provider based out of Dubai, to offer a new premium door-to-door transportation service, Emirates Pets Plus, across 16 markets. 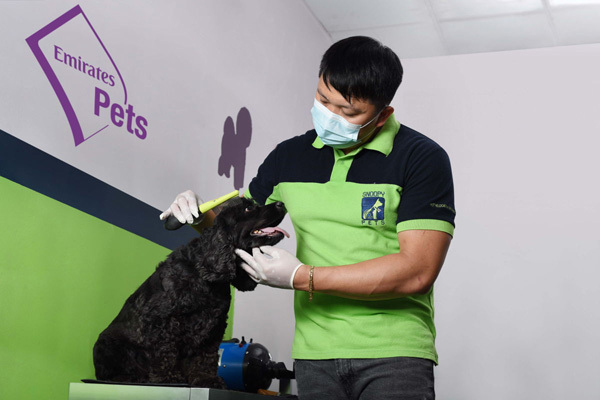 Under its premium service, the complete logistics of transporting the pet, including filing all the required documentation, taking the pet for any required veterinary checks and transporting the pet to and from the airport, will be managed by Snoopy Pets on behalf of the customer and Emirates SkyCargo. The markets where this service is available are the UAE, Bahrain, Brazil, Cyprus, France, Germany, Ireland, Italy, Malaysia, Netherlands, Portugal, Singapore, South Africa, Spain, Switzerland, and the UK. With Emirates Pets and Emirates Pets Plus, owners wishing to take their pets with them on extended holidays also have the option of booking a return flight for their pets with Emirates SkyCargo. In the last two years, Emirates SkyCargo has transported over 11,000 domestic pets, mostly dogs and cats on its flights. Close to 60 per cent of the animals flown have either started or ended their journey in the UAE. Nearly 3,000 pets have travelled to the UK over the same time period with the air cargo carrier. Emirates Pets has been designed keeping in mind the safety and comfort of the pet and offers special features including tracking and tracing of the shipment, late cut-off time for pet acceptance at origin, dedicated animal care areas at Emirates SkyCargo’s hubs in Dubai International Airport (DXB) and Dubai World Central (DWC), temperature protected transportation on the ramp, special handling facilities worldwide, as well as availability of veterinary care on a 24/7 basis.